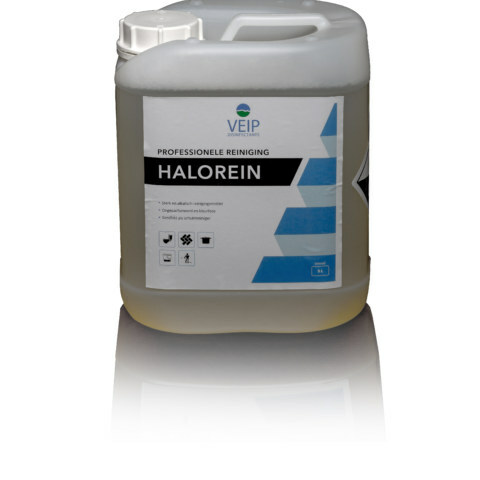 Halorein is a highly concentrated mild alkaline cleaner. It has a strong cleaning effect, is perfume free, colorless, biodegradable and environmentally friendly. Halorein is used in healthcare, food industry and animal care. Halorein smoothly removes fats, proteins and other organic contamination of walls, floors, plumbing, work tables, work surfaces and equipment. Is safe for all metals, plastics, stone (exclude calcareous natural stones like marble) and wood surfaces. Can be used manually or mechanically (low pressure foam unit). Before use, read the label and product information. Available in 5 liter package.